Ukrainian civil volunteers report Russia's hybrid military forces are attacking Ukrainian positions near the Ukrainian-controlled strategic port city of Mariupol with all available weapons on Monday. "According to preliminary reports, an enemy fortified position has been completely destroyed together with the terrorists. The enemy has been intensifying the shelling and is already firing on its former positions. Enemy main battle tanks are also engaged in the fighting," the People's Project volunteers' center reported on Facebook on Monday, March 20. Later, the center shared an update, saying that the hybrid troops are using Grad multiple rocket systems, tanks, banned 122mm and 152mm artillery systems and mortars. 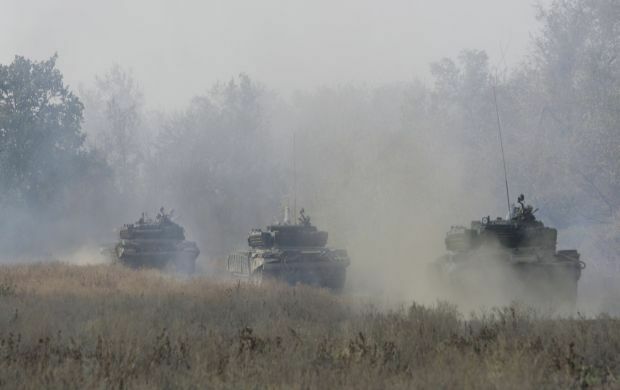 "At least nine Ukrainian troops have been wounded in action. Information about the casualties is being verified," the center wrote. In turn, volunteers from the Povernys Zhyvym [Back and Alive] project report that the fighting in the Mariupol sector goes on: the enemy continues to intensively shell the advanced positions of the Armed Forces of Ukraine (AFU), using large-caliber mortars and cannon artillery systems. "There is confirmation that around 12:00 Kyiv time, the terrorists fired Grad MLR systems," the volunteers said, adding that, according to unconfirmed information, there were wounded among the AFU fighters. "A severe battle was near Mariupol in the morning. Welcome back to 2014. We would like to be mistaken, but it seems to be very serious. There are wounded among Ukrainian soldiers," volunteer AKA Serg Marco wrote on Facebook. Meanwhile, the Anti-Terrorist Operation (ATO) Headquarters reported that the village of Vodiane was under fire from Grad systems. It is noted that the Ukrainian positions near Vodiane in the Mariupol sector were fired by the occupiers with the use of Grad systems, 152mm and 122mm artillery systems, and 120mm and 82mm mortars. "According to preliminary reports, one Ukrainian soldier was killed and another eight were wounded in battles in the Mariupol sector," the press center said.